This is a scene from the episode title "Flame Red." 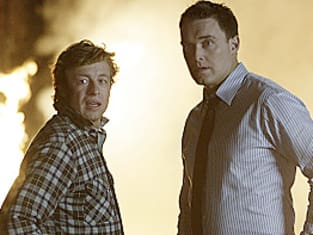 It was the 9th episode of The Mentalist's first season. 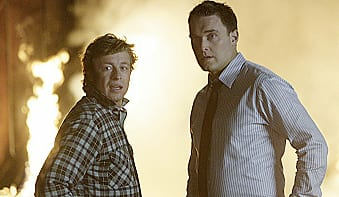 The Mentalist Season 1 Episode 9: "Flame Red"
Kimball: Somebody framed you for shooting at us, Mr. Machado? Because from where I stood, sure looked like it. Ben: That was a misunderstanding. I didn't know who you guys were. I was defending myself. Ben: From someone trying to kill me. Just like they killed Rich and tried to kill Trey. Kimball: And why would you be next on someone's "To Burn"-list? Kimball: Hey, do you wanna go to work or do you wanna play nurse with King Tut?